NOTE: Listed price is for the 4-Cell Butcher Bird ARF version. 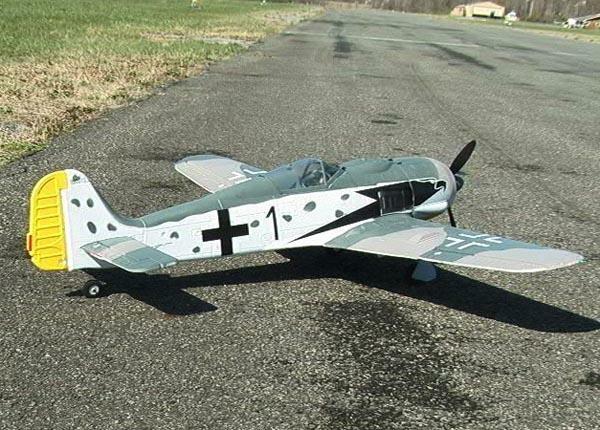 This 1200mm FW-190 is far nicer even than it looks- solid high-impact plastic front end, retracts with sequential wheel cover doors, flaps, lights, prop-mounted motor cooling fan, side cowl exhaust ports, and massive amounts of detailing. 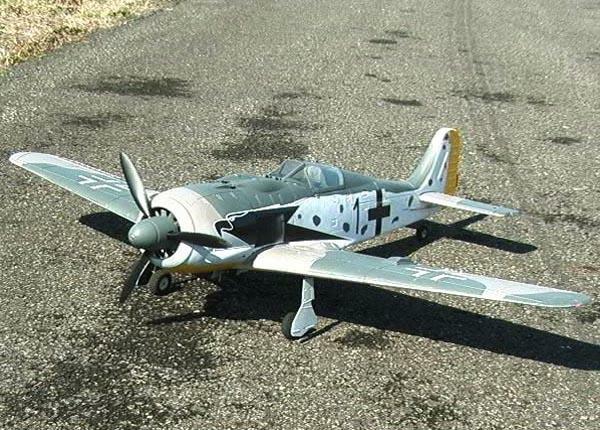 (That's a 12" prop on there, by the way) beautiful styling and workmanship, LOADS of power (the most powerful 3 cell plane in it's weight and size class, and the new 4 cell version is a rocket), and handling that gives you true fighter performance- a perfect flyer that puts other planes in it's class to shame! 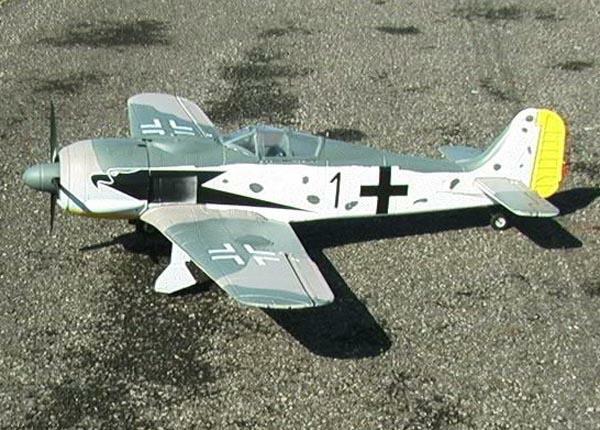 I must admit that I was, at first, unhappy with the short gear- until I flew it! 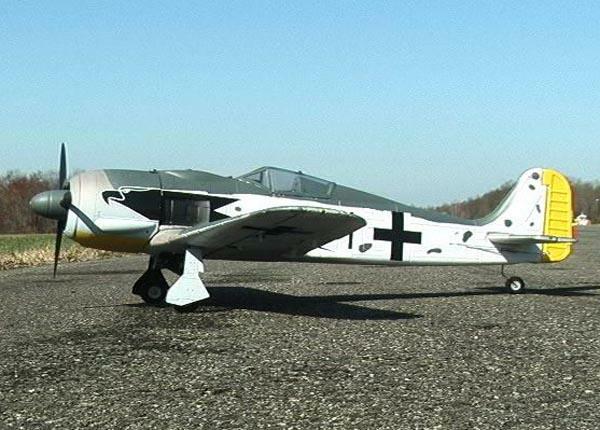 I could go on and on about this truly gorgeous plane that was almost never built! 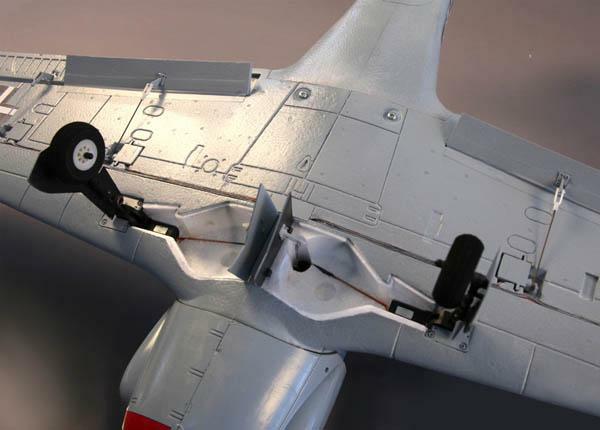 The designer I mentioned is Mr Liang of HC Hobby, the guy who designed the HC Hobby Mosquito, B-25 (the first one that everyone else like FMS copied) and the truly elegant HC A-10 The 20 people who saw the original sole run of these FW-190s have been chomping at the bit ever since. 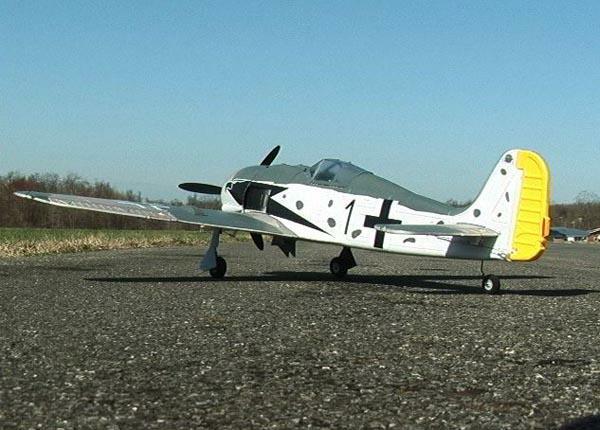 The moulds for this gorgeous plane were purchased by Top RC,who began production in November 2011, with some improvements, believe it or not! Better prop, Carbon Fiber Wing Spars, bigger motor, just to name a few. 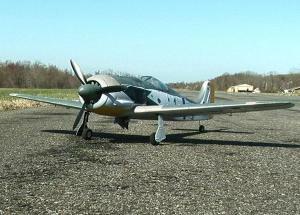 We now carry this plane! WOO-HOOO! 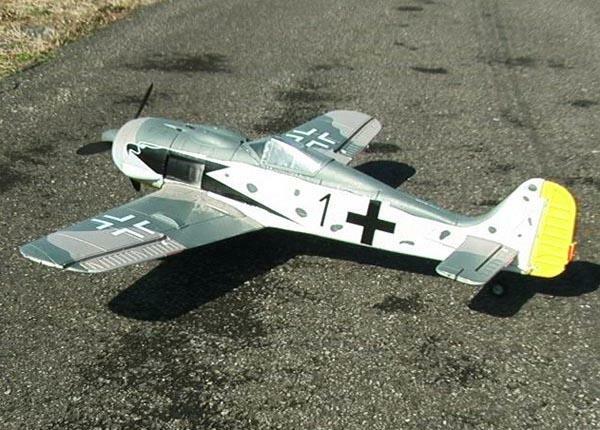 Get your TopRC FW-190 today! I'll wager that you'll be contacting us about how nuts you are about this plane! You can select extra stuff from the menus above, like Crashproofing, extra props, (the plane comes with one prop), extra prop spinners, batteries, etc. There's a selection to have us enlarge the battery compartment if you want to fly it with a 2650 or 3000mah like I do (we enlarge the battery location and reinforce the compartment with plastic plates) This baby fairly SCREAMS with a 3000mah 3s 25c battery- that's what I have in her on the video. Did I say WOO-HOOO yet? And for those of you who have a NEED FOR SPEED, we have the NEW 4 cell version, only available at Killer Planes. Bigger motor plus more power equals FASTER!! The 4 cell version is only available in the Grey "Butcher Bird" color scheme, in ARF or RTF. And, of course, the custom reinforcement kits- we call "Crashproofing" with CDRT (Crash Damage Resistant Technology). 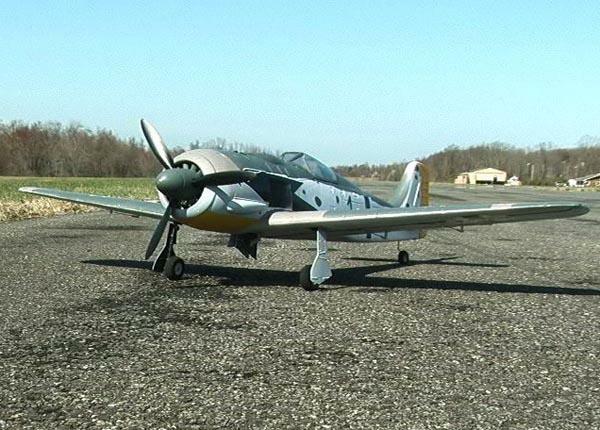 Our reinforcement kits will literally save your plane from being destroyed in many scenarios! 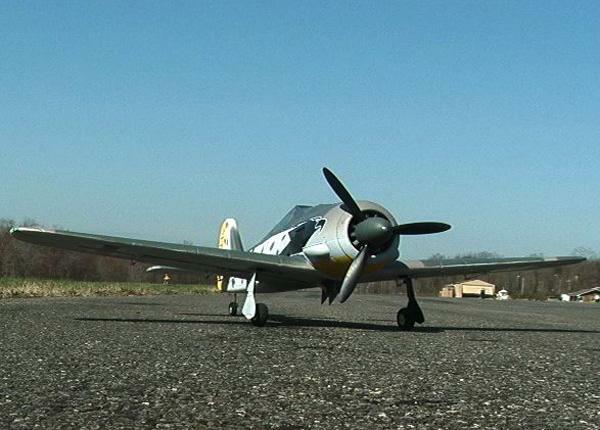 We'll have the video up soon of our TopRC FW-190 making a 200 foot spiral dive through a dead tree onto pavement! The crash resulted in some repairs, but would have totally destroyed any other plane without Crashproofing installed! (You'll see in the video- a very high wind a couple of hundred feet up very quickly took the plane so far away that I couldn't tell which way was up. It was the other way.) I wasn't even doing anything stupid that day- just got blown away by the wind. I still ended up crashing my plane, though! What's this story mean? GET THE CRASHPROOFING! I have one last thing to say- I like to sling planes around like they're in a dogfight or coming after something on the ground, and I love doing that at full throttle. Here's my tip of the day- if I were going to purchcase only one warbird of this size class (around 1200mm), I can tell you after flying loads of them- I'd get this one. Nuff said. The REAL last thing: After getting the production run of these planes, I have a few more comments. This plane is THE best packed plane I have ever seen. The BOX is made of better foam than some planes, and, unlike many other planes I've seen, has a complete cardboard box with a complete foam inner box. All the parts are REALLY secure and protected, to the point that major shipping damage done to one of the boxes (which scared us badly) didn't affect a single part of the plane inside. The quality of everything this company does is simply top notch- I haven't ever seen a better overall product in the RC plane world. After getting loads of Dynam planes damaged (inside the undamaged box!) during shipping, this is a refreshing alternative- a plane, and all it's parts and packaging, done with forethought and care. Details like the HEAVY DUTY plastic front end have to be seen to be believed- there is simply no other foamie I've ever seen built like this one! BIG round of applause to TopRC! Steve is of the opinion that this plane is WELL WORTH reinforcing and spending the time on to upgrade- it's a gorgeous, great flying plane! • 2200mAh 3s 20c battery (2200mAh 4s 20c battery in the "4 Cell Version") Then you can upgrade to the 2600 - 3300mAh. • BIG 400w Brushless Outrunner Motor (480w Motor in the "4 Cell Version"
• HEAVY DUTY resilient plastic front end- the entire nose section, up to the cockpit!